when can we expect this real life version of Aurra Sing to be released, I need this type of character... the lone, and dangerous female bounty hunter..
Hasbro stated that despite what the collecting sites reported, the street date of 1/30/2012 is still in effect. So, expect Aurra to show up on that date, as a Walmart exclusive. Yeah, you'll be really disappointed if you keep looking for her at Target. Here's a pic from the UK Toy Fair. It features three new TVC figures coming later this year. Two EU figures, and one from Return of the Jedi. So weird! This weekend I attempted to peice together a Galen Merik in flight suit as depicted! Now I don't have to worry but be patient for it! Thanks Hasbro for giving fans what they want! Thanks Hasbro for giving fans what they want! I don't mean to be rude, but they are giving you what you want. I am disappointed that they are using two slots for EU figures, since I couldn't care less about video game figures. At least I'll be saving $20. Not rude at all, we all have our own needs and wants. I agree that only 1 EU figure should be done if only out of 3, always! I am just happy to see them take another wack at Galen but am more excited because of the outfit they chose to depict him in. The flight suit training gear is very BA in my opinion and the version I hoped we would one day get in an action figure. This is will be my definitive Galen Marek and I will have to grab two so I can keep one carded. Any news on the release dates? What an amazing time to start collecting back when I did! I would be missing out even harder than I have been! Not rude at all, we all have our own needs and wants. So true! You're a wise man, Ridge of the 913th Attack Battalion! 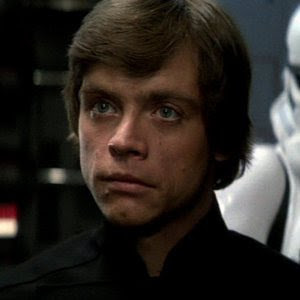 It seems Luke's hair is now parted to the correct side, if anyone else has seen pictures of him... the head sculpt looks much better IMO than the original we saw a few months passed... this makes me very happy.. It seems Luke's hair is now parted to the correct side. Ahh do you think it will be fixed upon release?!? That alone is enough reason to not make this a definitive version IMO... ouch Hasbro, OUCH! Nope, it's way too far along in the production process. To correct it, Hasbro would have to scrap the whole release schedule for the figure and resculpt the entire head. And that would probably push its release back to 2013 or 2014 (and cost them a sh-tload of money). So, this is the one that you're going to get. It's a pass for me for that very reason.